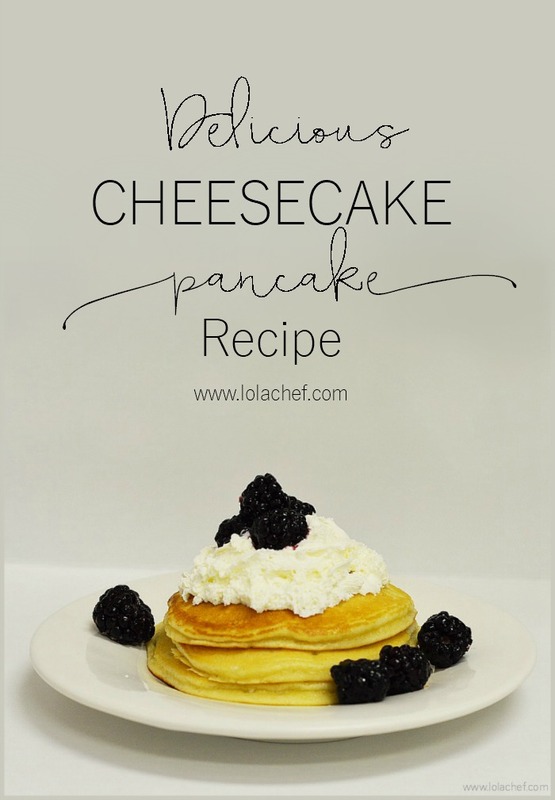 This recipe for cheesecake pancakes is a favorite around my house. Most family and friends that come to visit request them ahead of time. It makes me happy because I pretty much love cheesecake flavor in almost anything! These taste great topped with homemade whipped topping and almost any fresh fruit. This recipe makes a lot of pancakes, perfect if you are feeding a crowd. It’s even a lot for my house, but I do make a lot at once and save leftovers for busy mornings. You can freeze for a couple of months, or refrigerate for up to about 4-5 days. I usually save them in the fridge for breakfast for the kids before school. In my opinion, if you are going to go through the effort to make homemade pancakes, why not make extra so you don’t have to make them fresh every single time. My grandma used to make all her pasta homemade. Whenever we requested spaghetti she simply went to the freezer and pulled out frozen fresh pasta…it was soo delicious and didn’t take her all day to make! In a large bowl whisk flour, salt, baking soda and baking powder together. In a separate bowl put whole milk & lemon (this will curdle). Place butter and cream cheese into a mixer, add sugar and mix until blended well. Add eggs one at a time, until blended. The batter may appear lumpy. Alternate starting with dry ingredients and milk mixture mixing on low after each addition. You want to incorporate the ingredients well, DO NOT over mix. The batter will still appear lumpy, you can add additional milk for thinner pancakes or add more flour if batter is too runny. Heat a griddle to 350 degrees, or a pan at medium heat depending on each individual stove. Spray surface with non-stick cooking spray. Pour batter onto heated surface, flip once the sides are set and the middle has bubbles. Total cook time should be a few minutes on each side. To help make all these pancakes quicker I use a griddle such as BLACK+DECKER GD2011B Family Size Griddle, Black Saves so much time! When making homemade whipped cream it is best to use cold appliances. Placing the bowl and whisk that will be used in the refrigerator helps the consistency of the topping. 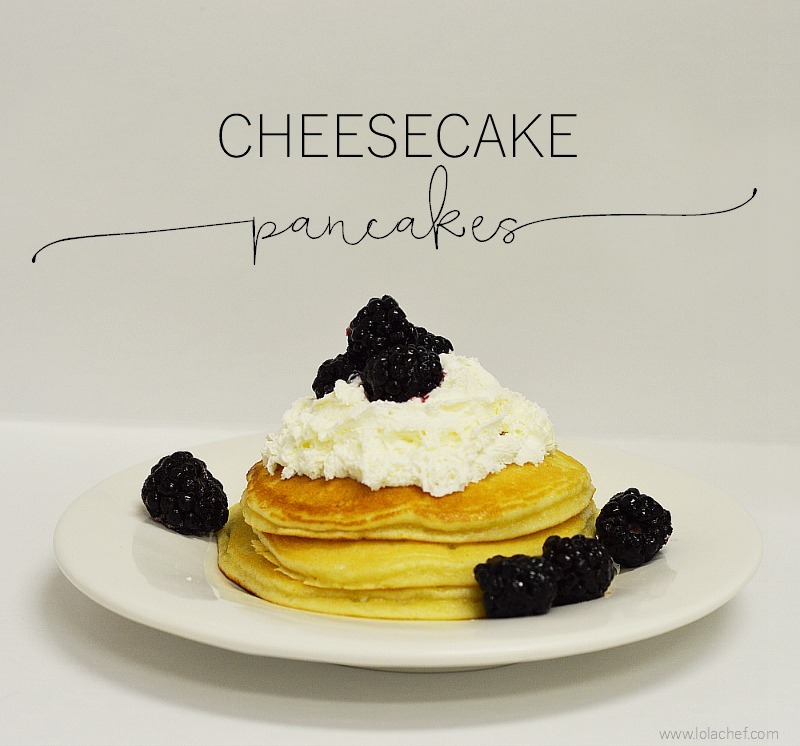 The added lemon goes well with cheesecake pancakes and tastes good with fruit. If you prefer plain whipped topping, simply omit the lemon. The metal bowl of a KitchenAid KSM153PSCB 5 QT Tilt Head Artisan Stand Mixer – with the KitchenAid K45WW Wire Whip for Tilt-Head Stand Mixer work well when placed in the freezer for a few minutes. (I wish I had this hot pink one, mine is gray…still pretty and works great though). Using the (cold) whisk attachment of a stand mixer place heavy whipping cream in cold mixing bowl. Add vanilla, lemon and sugar in small amounts (about 1/2 cup at a time). Turn mixer on high speed and let it mix for a few minutes. You can occasionally stop and scrape sides. Slowly add more sugar and continue mixing. Taste to see if sweet enough, based on individual tastes you may need to add lots more sugar. Once the mixture starts to form soft peaks it is ready. Store in refrigerator until ready to serve. Keeping it chilled helps it hold its shape when placed on warm pancakes. “We are a participant in the Amazon Services LLC Associates Program, an affiliate advertising program designed to provide a means for us to earn fees by linking to Amazon.com and affiliated sites.” I only provide links to useful products that I recommend, all opinions are my own.